I started this project in late August, but while ripping a 2×4 in half. 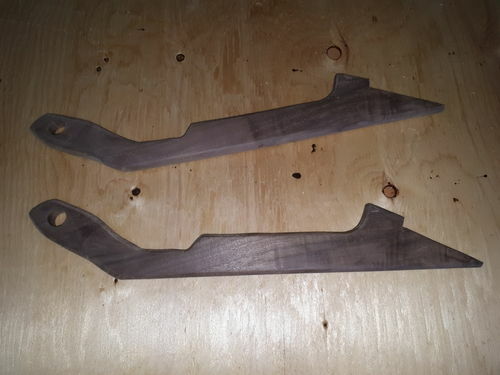 I dragged 2 of my knuckles across my table saw blade. I made a nice dado across my middle finger that required 4 stitches and a gross flap on my ring finger of my right hand. I still can’t make a fist or give the middle finger properly. So after about 5 lomg weeks of not using power tools. I was finally able to finish this nesting box. The chickens like it and happy chickens make a happy wife which equals a happy life. I had to give up on keeping chickens… while we have a really nice chicken coop, they kept getting eaten by critters around here. I’ve gone through about 4-5 dozen over the past 10 or so years, all mostly raised from chicks. Hawks, raccoons, snakes, etc… Just can’t keep those buggers from getting to them. I finally threw in the towel and now just use the coop to age my turning blanks. Link, OUCH! Push sticks might be a good next project. I like the design and the bins are a good idea. Looks like all the critters and your wife should be content. Hope you continue to heal. First of all, I hope you heal fast. That looks like a really nice coop you have for the birds. I raised the floor in the coop I built and really can’t stand in it….I might have to redesign that in the future. We were having problems with the girls laying eggs all over the run (they are not free range as we live in a old lava flow area with out grass…we have grass, just not the type they would like to play in), so we installed a couple small plastic tubs like you are using and it worked. Do the gray plastic been’s shown in your picture work well for nesting also? My finger is healing and it’s funny that you mentioned push sticks Al. The first thing I did when I could use my table saw and band saw again was make 2 push sticks from a chunk of walnut I had. I’ll post them when I sand them up nice and stain them. We had cyotes eat 6 of our birds this summer. Ours have a huge barn and big yard they play in all day. Lots of eggs in it so far in the bins. They were $2 each from a local dollar store. They are about 12”x14” and 6” deep. The bins are for dishes, but work great for this. Each one just pops out for easy cleaning. It looks like it works well. It’s too bad about your fingers and I hope that they heal up completely. Thanks Charles. These new push sticks will help keep my fingers safe from now on.